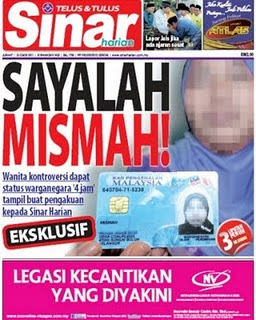 Starting with a few day's ago, opposition party has revealed a name of 'Mismah' who has been given fast-track citizenship which about 4 hours from the PR status before that and ready to be a voter. They said this is one of the way for the Government to win the election soon. Short story : Mismah is the truth person who have been given a citizenship but not in 4 hours, but she has waiting for 17 years before she had that. So, what's next? Is it 1000 or 2000 people can make real different for the election? If the Government had the majority more than half people in Malaysia vote for them, 2000 people can make a different? Ermm.. My brain full with the algebra formula to solve it. FUNNY! Salam Ramadhan al-mubarak. Dekat-dekat raya dan pilihanraya ni memang banyak magik yang boleh kita perhatikan.